My Journey to Fit: Play Ball! 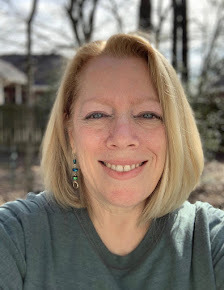 I've always loved baseball - I was on the baseball support team (NOT called a ball girl, ick) in high school, our kids played it starting with T-ball (Sam played all the way until 8th grade), and we used to go to the San Antonio Missions games (Minor League) back when we lived there. 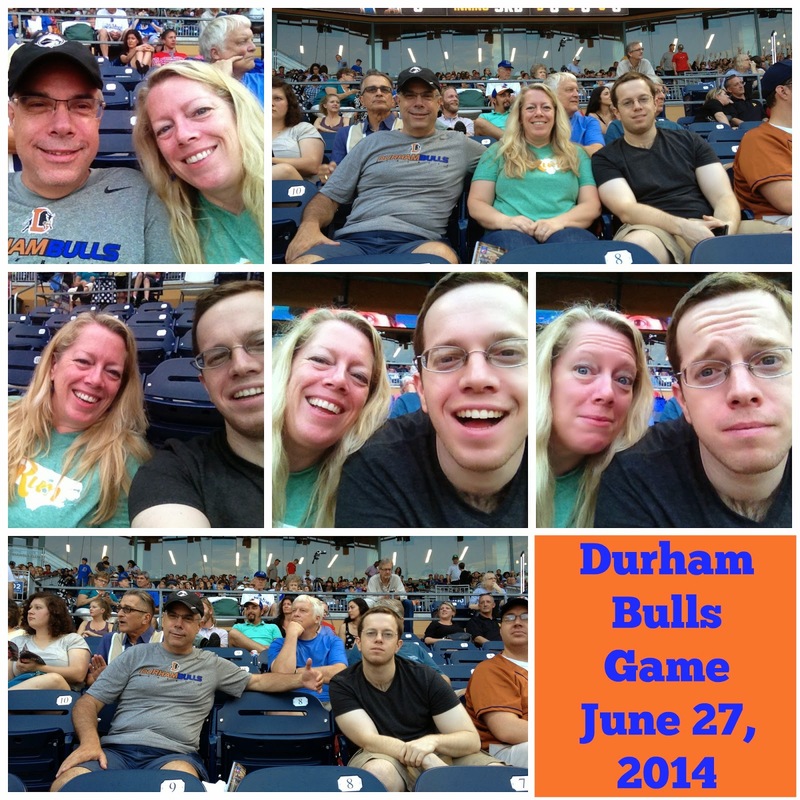 So naturally, when we came to North Carolina during baseball season, we had to make a trip to watch the Durham Bulls (yes, like the movie) play. The Durham Bulls ballpark is so nice. The current version was built in 1995 and was designed by the architects who did Camden Yards and Jacobs Field, among others. We lucked out with the weather - it was maybe 80 degrees when the game started, overcast, and there was a cool breeze! I was totally expecting a humid swamp, but I guess the weather gods took pity on us...we get enough of that in Texas. We splurged a bit on the tickets and got seats in the premium section, which not only had us super close to all the action, but we also were protected from foul balls by a net - my reflexes have never been fast, and I didn't want to spend the game ducking and/or cringing as errant balls flew at me. This was a good decision, because there were A LOT of foul balls during the game! We were in row C, which is the third row, right behind home plate. Sam said that we were going to see a lot of butts. I replied that it wasn't a problem for me...good to know I can still make my kids cringe, haha! Our view. A player from the opposing team got hit by a pitch on his hand/wrist area, and we could see his pain clearly, poor guy. The other weird thing was that wads of bubble gum kept appearing on the grass behind home plate. I counted 11 by end of game - gross! This was all coming from the players as they stepped up to bat. Minor league baseball games are always fun because of the entertainment that is constantly going on - lots of interaction with the mascot, little kids, and even the workers - at one point a crew came out to sweep the infield while "Ice Ice Baby" was playing over the loudspeakers, and they all dropped their brooms and started dancing - too funny! 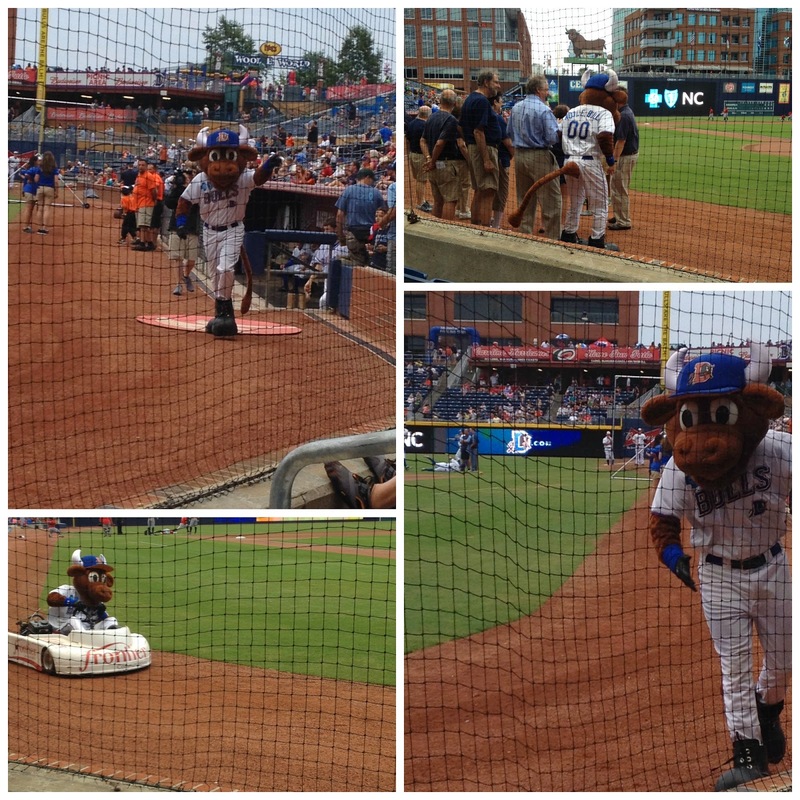 Wool E. Bull is the mascot and he was everywhere! Lined up with the group who sang the national anthem, zipped around the field on his go cart (that Sam and Jeff both wanted to drive), got chased around the bases by little kids several times, shot t-shirts into the crowds from a hot dog gun - he was awesome! We had a great time - only thing missing was our youngest, who was working back in Texas. Can you see us? My light green shirt makes it somewhat easy to find us in the crowd. All together now: OOOH! AHHH! This was a great experience - we ate traditional ballpark food (hot dogs and Cracker Jack) and were tempted to buy some peanuts from the very entertaining vendors who were roaming around our seats, but none of use really wanted peanuts. Even with a near-full ballpark, it wasn't crazy getting out of the parking garage afterward. We'd definitely go back for another game! I saw your photo on facebook and SMILED. 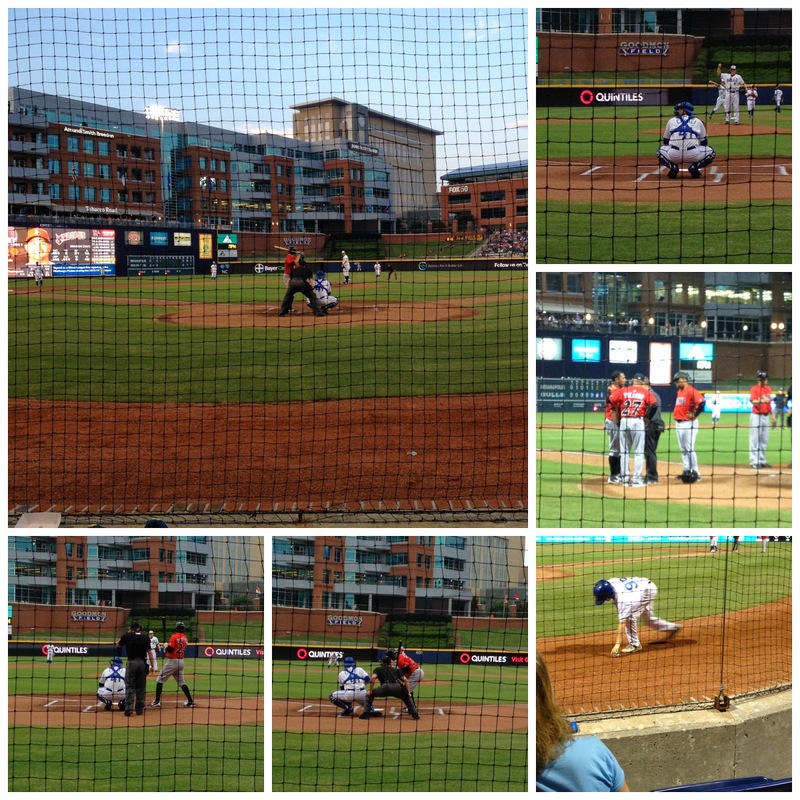 Seven years in CHAPEL HILL and so so many many durham bulls games. Such a fun place to live - I still can't believe you left this area! Looks like so much fun! I don't really like soccer but it's the biggest sport here in Holland so I went to a game once with my parents and it was fun to do even though I didn't really like it. But you do like baseball which makes this trip so much more fun. I agree, going to a sporting event is usually fun in person, even if you're not really into it. You are having such vacation-y good fun back there! Have you seen that show "The Mask?" About mascots? I've seen bits and parts. Those people really get into that job! I haven't seen that show - but I can see how they'd have to be super enthusiastic to be a mascot. They really keep the crowd pumped up! That looked like danged good fun! Just what summer is meant to be. The gum made me think about prizes given away by the Red Wings hockey team where part of it is being able to sit in the players bench. Gag. I don't THINK so! 'Nuff said. LOL - I agree, it would probably be pretty gross there. 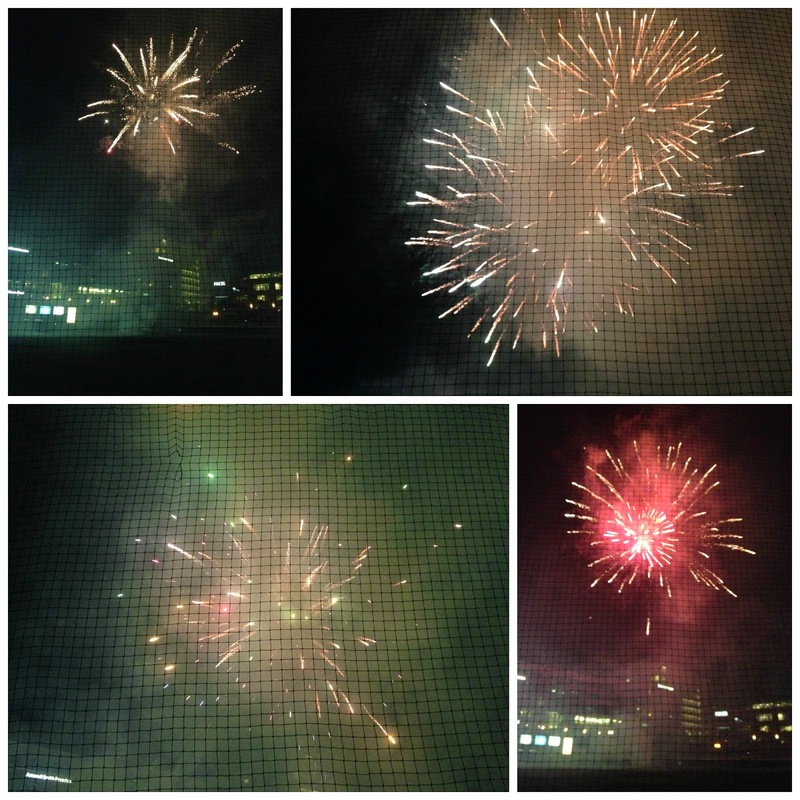 what fun - I love minor league baseball... sounds like you had a great time. Did you get a little t shirt for paco ?? Was the hot dog worth it? I went to a professional game a few years back and had heard that the food was soooo good. I was actually disappointed! But the game is always fun, right? Baseball, hands down, is my favorite sport. I played from 4th grade on, and played in an adult league until well into my 30s - I used to even bring Hannah when she was little and she was our bat girl! When we went to Florida for a spring break one year (I think 2005?) we went to a major league game's spring training game - it was the Cleveland Indians and Coco Crisp was playing for them then. Our 1st base outfield seats were so close I felt like I could reach and out touch him in the outfield! And I always loved seeing him on t.v. after that, and Tony got sick of me saying "hey, there is Coco Crisp!" Ha! Sorry your one son missed out on a fun day! I never liked baseball until I moved to Colorado and I was there for the birth of the Rockies, so I got swept up in it. We went to some games,which was really fun, actually. Not to mention how beautiful Coors Field is. Once we moved to IL and then there was some player thing about money and I lost interest in baseball. Football is still my true love.